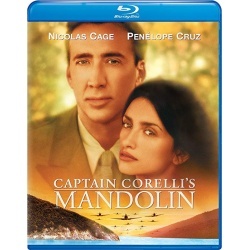 Nicolas Cage, Penelope Cruz, Christian Bale and John Hurt star in the breathtaking romance, Captain Corellis Mandolin. Captain Antonio Corelli (Cage) is an Italian officer whose company of soldiers is sent to Cephallonia, a beautiful Greek island untouched by war. A free spirit with a passion for music and romance, Corelli is enchanted by Cephallonia and its people - especially Pelagia (Cruz), the gorgeous, proud daughter of the island's doctor (John Hurt). Engaged to a local fisherman (Christian Bale), Pelagia resists Corelli's attentions, but the kind and charming captain weakens her defenses. Surrendering their hearts, Corelli and Pelagia begin a heated affair. However, before love can grow, the war crashes on Cephallonia's shores, forcing Corelli and Pelagia to make dangerous sacrifices for country and home... and risk losing each other forever.